AccessPress Custom Post Type is a custom post type WordPress plugin to manage posts in various existing custom post types. When plugin is activated, you can see custom post types like “Services”, “Products”, “Team Members”, “Testimonials”, “Clients” and “Portfolio” etc appear and you can add these in your website. You can add posts for any existing custom post type and display on front end by using shortcodes. Also, we have written the frontend CSS in such a way that it inherits CSS classes / designs from your theme’s master CSS. 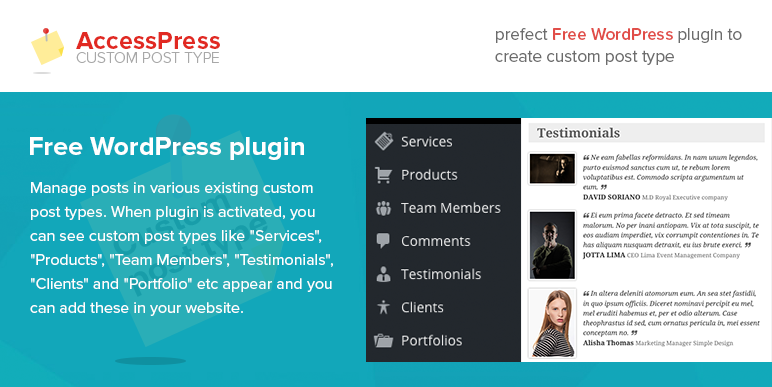 Hey Buddy!, I found this information for you: "WordPress Custom Post Type Plugin – AccessPress Custom Post Type". Here is the website link: https://access-keys.com/wordpress-plugins/accesspress-custom-post-type/. Thank you.